Pleistocene Gigantopithecus blacki is the largest species of all extinct and extant primates. Its diet, distribution and evolution remained unclear. According to a paper in press in the journal of Quaternary International (2012), paleoanthopologists from Institute of Vertebrate Paleontology and Paleoanthropology (IVPP), Chinese Academy of Sciences, reported fossil teeth of Early Pleistocene Gigantopithecus blacki and associated mammalian fauna from Baeryan Cave, Bijie County in Guizhou Province, providing new evidence for analysis on this giant apes diet, living habitat, distribution and evolution. The Baeryan cave fossil site located in the Yunnan-Guizhou Plateau, is the highest site in altitude among known sites of G. blacki, and was exposed when a local farmer made excavations in the 1980s. 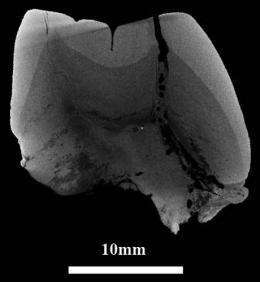 Five isolated teeth of Gigantopithecus blacki and other mammalian fossils were quarried out in 2001-2004. All teeth crowns are well preserved. Compared with the large assemblage (IVPP laboratory, Beijing) of Gigantopithecus teeth from Juyuandong cave, Liucheng County, Guangxi Autonomous Region, the morphology features of Baeryan Gigantopithecus teeth show no difference. A total of 21 species were identified from the Baeryan Cave site, including G. blacki, Ailuropoda microta, Pachycrocuta licneti, Cuon dubius, Ursus thibetanus primitinus, Panthera sp., Dicoryphocheorus ultimus, Muntiacus sp., Cervavitus fenqii, Cervus cf. unicolor, Budorcas sp., Caprinae gen. et sp. indet., Gazella sp., Leptobos sp., Tapirus sanyuanensis, Nestoritherium sp., Rhinoceros sinensis, Rhinopithecus sp., Stegodon orientalis, Rhizomys sp., and Hystrix subcristata. They are the typical elements of the Early Pleistocene fauna in South China. Enamel stable carbon isotope analysis on Gigantopithecus teeth indicates that it is a pure C3 diet and lived in a forest habitat, which is clearly different from early hominins in South and East Africa, such as Australopithecus africanus, Paranthropus robustus and Paranthropus boisei, which had C4 diets. What kinds of C3 food did G. blacki eat? The high frequency of caries indicates a diet rich in carbohydrates or starch. 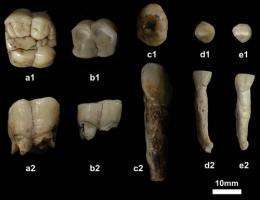 Fifteen carious teeth were identified from the total of 62 molars discovered in Longgudong cave. Thick enamel and blunt-cusp morphology of buccal teeth are related to the adaptation to feeding on hard objects, such as seeds and nuts. 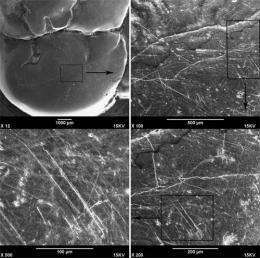 Both pits and scratches of microwear were commonly present on the occlusial surface under SEM, which implies an omnivorous diet. The microwear evidence and the morphological features suggest G. blacki had a frugivorous and highly fibrous diet. It was also likely Gigantopithecus fed on bamboo (C3 plant) as part of its diet. More detailed analysis is necessary for further interpretation of the diet of the giant ape. The fossil records indicate that Gigantopithecus was distributed widely during the Early Pleistocene, not only in the Guangxi area of South China (such as Juyuandong cave in Liucheng, Mohui cave and Chuifeng cave in Tiandong, Sanhe cave in Chongzuo), but north to the Three Gorges Area of the Yangtze River (such as Longgupo site inWushan and Longgudong cave in Jianshi), and also in the Guizhou Plateau, such as the Baeryan site in Bijie. In the Middle Pleistocene, Gigantopithecus withdrew southward to a limited area of South China, mainly in Guangxi Province (Heidong cave in Daxin, Bulalishan cave in Wuming, Nongmoshan cave in Bama), and more southward to Hainan island (Xinchong cave) and North Vietnam (Tham Khuyen cave). No fossil of Late Pleistocene Gigantopithecus has been recorded so far. The climate and environmental change during the late Early Pleistocene might have had a strong effect on the habitat and diet of Gigantopithecus, and made it withdraw southward into the subtropical forest where the climate was warm and wet. Homo had evolved and existed in South China since the Early Pleistocene. Enlarging Homo populations with increasing intelligence and abilities in tool-making and fire-controlling might apply competitive pressure on Gigantopithecus for territory and resources, and finally made Gigantopithecus go extinct through the middle to late Pleistocene. This work was supported by the National Science Foundation of China, State Key Laboratory of Palaeobiology and Stratigraphy of Nanjing Institute of Geology and Paleoontology, and the Specific Basic Research Program of MOST of China.